Bond Market Shrugs Off France's Presidential Vote The arguments for growth policies as opposed to austerity are taking center stage in Europe after the French and Greek elections. French President-elect Francois Hollande was voted in to a large extent because of his pro-growth, anti-austerity rhetoric, but he is not rejecting austerity altogether. The arguments for growth policies as opposed to austerity are taking center stage in Europe after the French and Greek elections. His rhetoric aside, France's President-elect Francois Hollande is not rejecting austerity. In fact, he pledged to balance France's budget by the end of his five-year term, just one year later than his opponent, outgoing President Nicolas Sarkozy. That's one reason the bond market's reaction to Hollande's victory was a yawn. Jacob Kirkegaard, a fellow at the Peterson Institute for International Economics, says the market correctly perceived that the president-elect is not going to embark on some huge stimulus program in France. 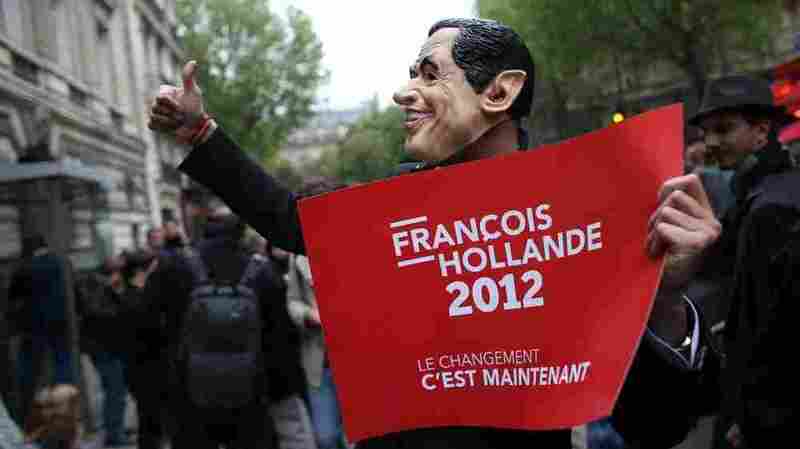 Kirkegaard says that's likely to disappoint many of Hollande's supporters. "He has led them to believe that he is going to usher in this new era of spending and the end of austerity through his rhetoric, but I think the reality is very, very different," Kirkegaard says. Nevertheless, Kirkegaard says, Hollande will push Europe to add a growth component to its strategy, "which is something that in recent weeks Angela Merkel and other German leaders have been positive about." The growth strategies being considered, however, don't involve boosting government spending at the member state level. Rather, they involve growth-friendly moves like reforming labor regulations, to make it easier for workers to cross borders and work anywhere in the EU. Other strategies include expanding the European Investment Bank, and funding infrastructure projects with bonds backed jointly by all EU countries, but most importantly Germany. "What I agree with is that Europe cannot solve its problems through austerity alone," says Mohamed El-Erian, CEO of the giant bond fund PIMCO. He's concerned about too little growth in Europe, but also about too much debt. "What bond investors are looking at in order to put in more capital is a set of policies that addresses too little growth and too much debt," he says. Bond investors apparently felt Hollande's victory was a move in that direction. Interest rates on France's 10-year bond fell to a seven-month low after the vote. There was greater market discomfort with the results of parliamentary elections in Greece. Moderates there lost ground to fringe parties on the right and left amid demands to renegotiate the Greek bailout package, with its tough austerity measures. The Greek stock market fell, and its banks were especially hard-hit. Jacob Kirkegaard says the results in Greece raise the odds that it may leave the eurozone, but he says the country's fortunes are unlikely to affect the world in the same way they did last summer. "This is really a fight between the taxpayers of Greece and the taxpayers in the rest of the euro area," he says. "This will be volatile, but I don't think it will have the huge contagious effect that we saw last year." Kirkegaard says that's because under the most recent bailout package, the big losses on Greek debt were already distributed, and Europe's banks are in better shape now than they were last year.